Sunny Deol’s son Karan Deol is making a debut in Bollywood with the film “Pal Pal Dil Ke Paas” directed by Sunny Deol and produced by Dharmendra’s production house Vijeta Films and Zee studios. “Pal Pal Dil Ke Paas” will be shot in Manali and it will be a love story. The teaser of the film has been released and it shows two lovers holding hands. Talking about the film, Sunny said “Life has come a full circle. My father launched me and now, I am launching my son. Karan is extremely passionate about his acting career and I am sure he will make everyone proud. I'm glad he will be making his debut with Zee Studios backing the project. I have full conviction in them and that they will leave no stone unturned to give the film its due”. 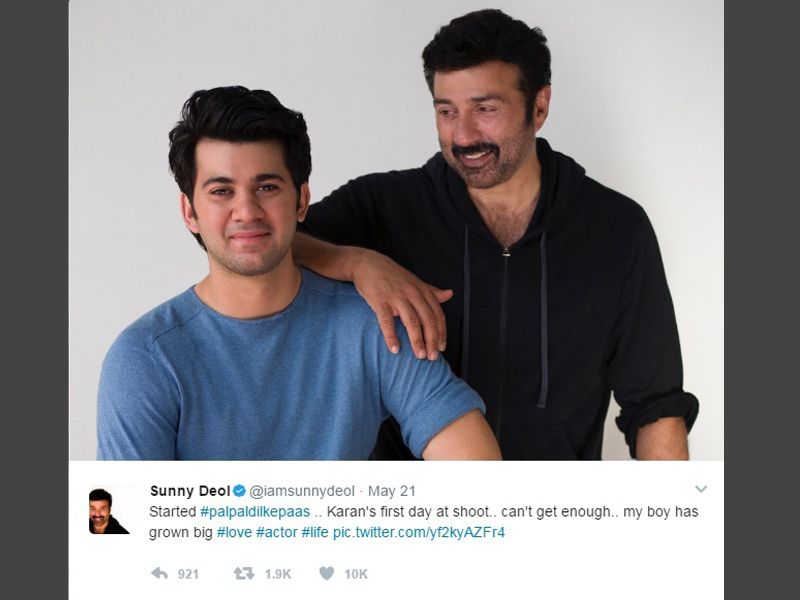 Sunny Deol took to Twitter to make the announcement by posting a picture with his son with a caption that says “Started #palpaldilkepaas .. Karan's first day at shoot.. can't get enough.. my boy has grown big #love #actor #life”. However the exact release date for the film has not been revealed. On the work front Sunny Deol will be seen in “Bhaiyyaji Superhitt” and “Poster Boyz” along with Bobby Deol.